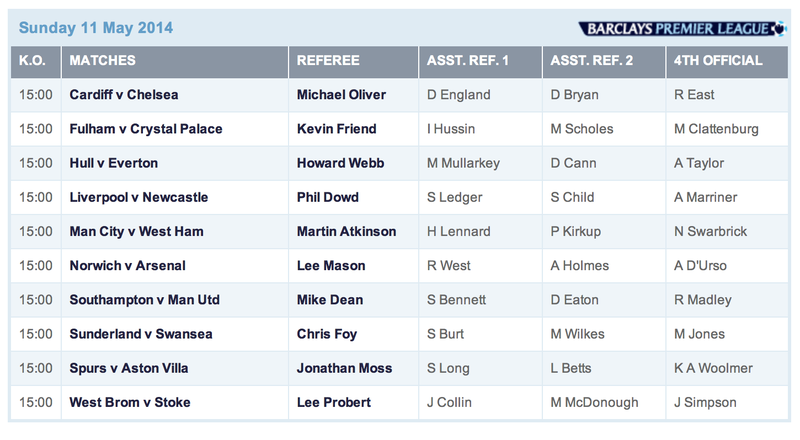 Here are the updated referee appointments for the last matchweek of the season, played on Sunday, May 11. Howard Webb’s got the band back together again – i.e., World Cup team Mike Mullarkey and Darren Cann (above, with Webb, center) – for Hull v. Everton. Phil Dowd takes a bow at Liverpool, with the Reds still holding on to the title by their fingernails. At 50+, I can’t see Big Phil refereeing at this level for much longer, so it’s fitting he gets a big match. The likely champions, Manchester City, will get another Old Guard referee, Martin Atkinson. Mark Clattenburg has a play off semi final match on Monday hence why he has no Sunday game for him. The select group referees do the Championship play off matches. I’ve put you the 3 missing ones Jenna. Maybe the notification hasn’t come through yet. Phil Dowd has Liverpool, Martin Atkinson has Man City and Lee Mason has Norwich. I’ll ask my Mum to ask on the referee forum. 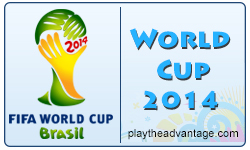 When is it & who is playing? Mark’s game is on sky sports 1 on Monday 7.45pm UK time, if you have access to that over there. Fox sports might show it.